Vihren Hut is found in Pirin mountain, it was built in 1939-1941 by the Bulgarian Tourist Union of Bansko at an altitude of 6396 ft (1950 m) above sea level on the left side of the rocky shore of Bunderitsa River. Initially, the hut was called El Tepe, the old name of Vihren Peak. Vihren Hut is a complex of 2 massive 2-story structures and bungalows. Vihren Hut has a tourists' kitchen, dining hall and buffet. It has outdoor bathrooms. Rooms have 5, 7 and more beds, and 2 of the rooms have pomegranate. The bungalows have 3-4 beds each. Vihren Hut has a parking lot, as well as electricity and running water. It's heated using solid fuel heaters. 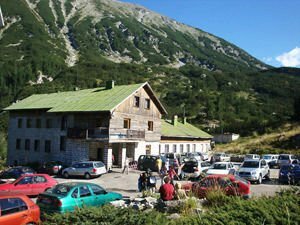 The starting point for Vihren Hut is the town of Bansko - 10 mi (16 km) along an asphalt road or a 4 and a half hour hike along the tourist trail. Vihren hut is a point along the E4 European long distance path. Camping on the hut's property is prohibited. Vihren hut is managed by Pirin Golf Hotel & Spa in Bansko and Strazhite Hotel. Phone for contact: 0889 834 277.